In 2011 the Institute carried out research according to the Plan of fundamental and applied research priorities of the Russian Agricultural Academy. Its aim was scientific support of the agro-industrial complex of the Russian Fede ration in 2011–2015 as well as implementing the R & D plan of the Institute for 2011. Th e Institute has also been coordinating research on fodder production in the Russian Federation and worked on other projects of the Russian Agricultural Academy Program as a co-executor. Keywords: forage production, forage quality, animal husbandry, crop production, arable farming, environmental management. The paper presents experimental data on the effect of different doses, timing and methods of foliar feeding with solutions of salts of trace elements, on productivity of Arctagrostis latifolia. The provided information is valuable for developing methods of controlling the nutrient fl ow in the grassland agro-ecosystems of the Far North-East, providing an increase in the use of plant nutrients and improving the quality of forages grown. Keywords: trace elements, Arctagrostis latifolia, productivity, feed quality. To organize the conveyor system of preparation of high quality feeds, and obtaining the dry weight yield of not less than 40–50 kg/ha in the Volga steppe, it is recommended to sow during surface improvement of floodplain meadows three groups of perennial grasses divided according to their earliness. Th e most early-maturing is goat‘s rue and twicecut red clover. Th e middle-ripe is goat‘s rue with red clover, smooth brome-grass and meadow fescue. The late-ripe herbage is alfalfa with goat’ s rue and once-cut red clover. Keywords: herbal link of green conveyor, maturity, development phase, feed quality, bio-energy coefficient. Th e article presents the results of microfield experiments on meadow-chernozem frost-affected soils. They show the effect of cerium microfertilizers on biological activity, productivity and chemical composition of the phytomass of natural meadow phytocenosis. Keywords: frost-aff ected soils, meadow phytocenosis, cerium fertilizer, biological activity, productivity, quality. Th e article gives comparative evaluation of chemical composition of the grasses grown on peat soils of the Kirov Meadow and Wetland Experiment Station. Keywords: festulolium VIK-90, tall fescue, perennial ryegrass, chemical composition, peaty soils. The article presents the results of breeding legumes in Siberian Research Institute of Feeds Breeding Centre. Keywords: variety, soybeans, broad beans, red clover. Th e article presents the achievements of the Volga RISS in breeding productive, high-quality, drought-resistant and plastic crop varienties. Keywords: variety, spring barley, grain sorghum, forage grasses. The article presents the study of development and productivity of sugar sorghum in the Primorye Territory, depending on growing conditions. Keywords: sugar sorghum, sowing time, productivity. In the South of Central Siberia the species composition of Sudan grass diseases is discovered. It is shown that the most common and harmful are root rots, Helminthosporium disease, bacterial stem rot, and red-brown bacteriosis. The results of developing new cultivars of perennial grasses on the basis of complex-hybrid populations for the conditions of Northern Kazakhstan. The article presents the results of the seed productivity analysis of perennial leguminous herbs grown in pure and mixed stands on the calcareous soils of Belgorod region. Th ere is a discussion of the possibility of breeding competitive long-standing forms with high seed productivity for further seed production and the descendants’ examination. Keywords: perennial leguminous herbs, seed productivity, competitiveness. The article presents detailed information on the technology of adding preservatives into forages at their producing. Keywords: fodder, preservatives, methods and applicators. 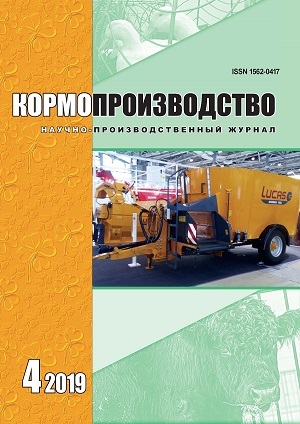 The book «Pre-sowing seed preparation by artificial coating» has been published. The book outlines the main provisions and methods for that process. It presents machinery for pretreatment, encrustment, encapsulation and pelleting of seeds. Keywords: technology for pre-sowing seed preparation, pretreatment, encrustment, encapsulation and pelleting of seeds, protective and stimulating components, treaters and pelleters.